The LAT does not measure the energy of the photons with infinite precision. The finite energy resolution of the LAT called the energy dispersion has been characterized by the LAT team and this information is part of the IRFs. For Pass 8, the energy resolution is <10% between 1 GeV and 100 GeV, which is sufficient to limit the spectral distortion to less than 5% in this energy range. Below 1 GeV the energy measurement is more difficult and the energy resolution worsens: it is ∼20% at 100 MeV and ∼28% at 30 MeV. As a consequence, ignoring energy dispersion when analyzing data below 300 MeV can induce potentially large systematic errors in the spectral fits of sources. While the energy dispersion correction reduces systematic uncertainties at all energies, the correction is particularly important below 100 MeV where the induced fractional change in the counts spectrum can easily exceed the statistical uncertainties. Therefore the LAT team strongly recommends enabling the energy dispersion correction for any analysis of data below 100 MeV. This page describes the recommended practices for modeling energy dispersion in science analysis and the internal implementation of the energy dispersion correction in the Fermi Science Tools. For analyses that neglect the energy dispersion correction, estimates of the the induced systematic uncertainties on the spectrum of a source are provided. We recommend that you disable the energy dispersion correction for any model components that have already been corrected for energy dispersion or were fit to the data without taking energy dispersion into account. For 4FGL data products this only applies to the isotropic template. For analysis using older diffuse models (gll_iem_v06.fits or older) the energy dispersion should also be turned off for the diffuse model, as well as any point-like or extended sources for which the spectral parameters are fixed to the 3FGL (also applies to 2FGL and 1FGL) values. 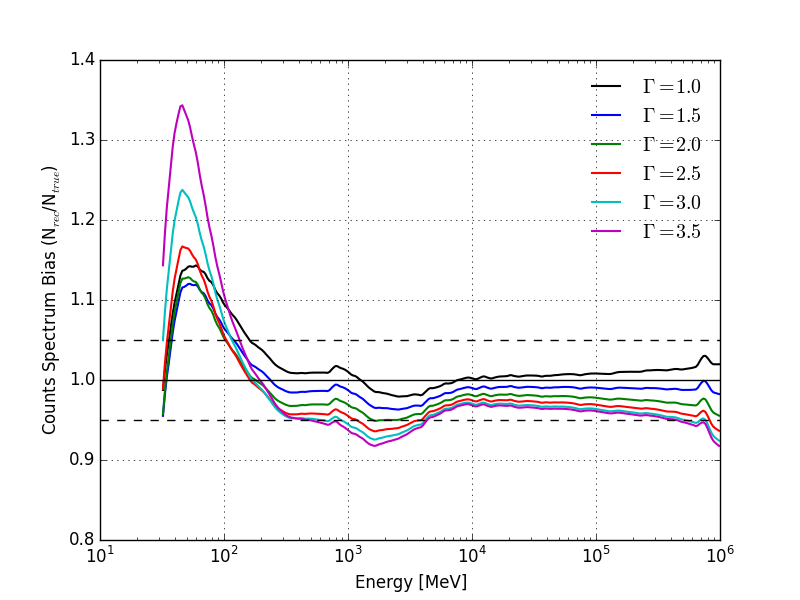 When the energy dispersion correction is enabled, the Fermi Science Tools internally add two energy bins above and below the analysis energy range when evaluating the counts model. These additional bins are used to evaluate the contribution of events with true energies outside the range of reconstructed energies used in the analysis. Depending on the chosen bin width and energy range, these two additional energy bins may not be sufficient to accurately evaluate the counts model near the edges of the energy range. Therefore when performing a binned analysis in which the energy dispersion correction is enabled, the LAT team recommends that you prepare the analysis over a wider energy range than the one in which the spectral fit will be performed. The spectral fit energy range can be controlled in python with the setEnergyRange(emin,emax) method of the BinnedAnalysis class. The choice of the adequate energy range depends on the energy bin width as well as the energy threshold, and it is left to the user. It must be noted that the level of spectral distortion due to energy dispersion depends also on the source spectrum, especially in the case of sharp features (like an exponential cutoff). NOTE: The current energy dispersion correction in the Science Tools does not take into account the interplay between the energy dispersion and PSF. As a consequence, even if the counts spectrum integrated over the ROI is well predicted, the spatial distribution is not perfectly reproduced. The LAT team is currently working on assessing and improving this aspect. Because of energy dispersion, the number of counts in a given bin of measured energy is the sum of counts at various true energies. In order to predict the number of counts in a given bin of measured energy, one must take into account the spectrum and the IRFs in a larger energy range than the width of the bin. That is why the Science Tools add two energy bins (one below logEmin and one above logEmax). You should keep in mind that, depending on the bin width and on the energy threshold, adding two bins might not be sufficient. For instance, in the case of 10 bins per decade, as in the DRM example above, it is necessary to take into account true energies down to logEtrue=1.8 to predict the number of counts at logEmeas=2. I.e. two extra bins below the threshold of the analysis are needed. Neglecting the effect of energy dispersion introduces systematic errors in both the shape and normalization of the count spectrum. The effect of energy dispersion is largest at low energies (< 100 MeV) but also induces a smaller systematic offset in the flux normalization at higher energies. The following plot shows the induced bias in the counts spectrum versus energy for P8R2_SOURCE_V6 IRFs calculated for power-law sources of different spectral indices. Above 300 MeV the induced bias is less than 5% but rises rapidly below this energy. The effect of energy dispersion is largest for sources with soft spectra (those with spectral index larger than 2), particularly in the energy range between 30 MeV and 300 MeV. Image Caption: The bias on the counts spectrum as a function of energy for different spectral indices with the P8R2_SOURCE_V6 IRFs. The dashed lines are drawn at a bias of ± 5%.